Martin Gray in his old age. Throughout his life as an entrepreneur he wrote a number of books, but his most famous one was written by someone else. The French writer Martin Gray, known for his autobiographical book For those I loved, was found dead in the pool of his house in Ciney, Belgium on 25 April 2016 at the age of 93. So read the newspaper report when his death was announced. But French? Martin Gray was born Mieczysław Grajewski on the 27th of April, 1922 in Warsaw, which made him 17-years old when the Germans and Russians invaded Poland in 1939. Yet in his “autobiographical” book he is only 14 years of age in that year. Lowering your age is in the tradition of holocaust surliever stories. Elie Wiesel removed a year from his real-life age in his “autobiographical” Night. He took 3 years off his younger sister’s age—she went from ten to seven. Paul Argeiwicz, whom I recently wrote about, reduced his age by five years, from 16 to eleven. It goes in the other direction too. There is a holocaust surlievor in the news recently who claims to be 112 years old. He lives in Israel. I don’t believe for a minute he is that old; he doesn’t look it but gives credit to a “positive attitude.” More likely, he got different papers after the war. There is also a female surlievor who claims she is 97, but looks more like 79. (More pictures here.) They all have some purpose in fiddling with their age – in the case of Grajewski I think it’s first because the younger he is, the more impressive are his amazing accomplishments. But also because he is portrayed as youthfully ignorant of all that preceded September 1939; all he knows is that their peaceful life suddenly ends, destroyed by the invading German neighbor who unaccountably hates them. The story he tells is like a child’s fairy tale, with clear-cut good and evil figures, victims and perpetrators. The Germans are the bad guys, of course, the Poles are victims who are turned nasty by the Germans, and only the Jews are authentic good guys. The Jews in Poland do what they have to do to survive the evil of others. In the story, his father is brave, strong, with admirable character. To me, my father—tall, straight-backed, and so firm of hand—seemed as if he were himself the origin of the world. His mother is loyal and loving. We’d come home, my father would open the door. I can still recall the sweet fragrance. My two younger brothers [and] my mother would be there and the table was set for supper. They owned a glove manufacturing business. They were prosperous, life was good. Then, as if out of the blue, disaster struck. There is no mention of Polish intransigence born of the British and French promise to defend Poland in just such an eventuality. No mention of the secret US diplomatic correspondence urging the Poles not to cooperate with Germany – diplomacy that went on for months while Poland grew increasingly belligerent toward the German proposals. No, this is a story only about the personal bravery of a young Jew… set among the familiar myths of the Polish Resistance and the role of Jews in it. He peppers his narrative of life in Warsaw after Poland surrendered with the obligatory incidents of German “soldiers” ridiculing Jews for sport, pulling at their beards, shooting them at will — things that did not happen in the disciplined ranks of either the Wehrmacht or of the police. The type of incidents described are solely meant to portray “the ugly Nazi” in contrast to the more civilized Jews, and to evoke as much sympathy as possible for their plight. Young NKVD Captain Mieczysław Grajewski wearing his Soviet decorations, including the Order of the Red Star. Toward the end of the war, he was recruited by the Soviet N.K.V.D. And served as an officer. 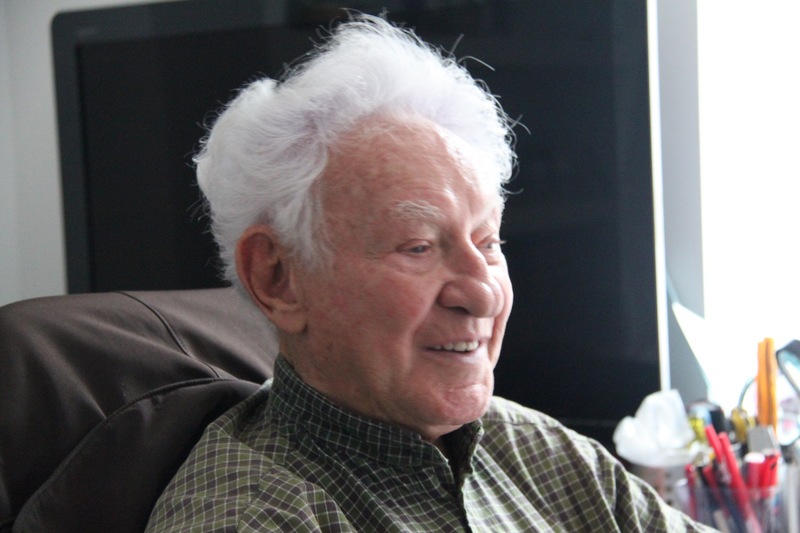 Gray says in his defense that his sole mission was to hunt down those who inflicted the Holocaust, and he deserted when he realized they were the mirror image of the other side. At 17, Martin is the head of the biggest smuggling organisation of the Warsaw ghetto. He is eventually caught by the Germans and recruited as a Sonderkommando in the infamous Treblinka death camp. All of his family is exterminated there. He manages the impossible feat of escape and participates in the uprising of the Warsaw Ghetto where his father is killed before his eyes. Consumed with revenge he joins the Soviet Army and becomes the youngest captain at 24. Let’s understand the Warsaw ghetto was established in October and November, 1940, when Grajewski was 18 1/2 years old, so his claim to be a mere 17 in the ghetto is false. 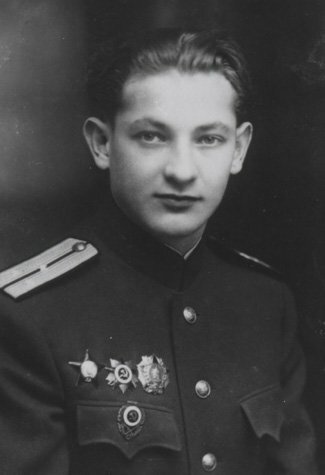 Plus, if he emigrated to the US in 1946, at the age of 24, he could not have first become an NKVD captain in that same year. The same with his claims about being a Sonderkommando at Treblinka and escaping from there, not just once but many times … and after his final, successful escape to return to the Warsaw Ghetto to participate in the uprising before he becomes a captain in the Soviet Army. Whew! What a hero! According to several holocaust historians, the Treblinka part especially is not true. But this doesn’t slow down the continuing advancement of his brand. The Facebook page tells us about a new documentary in the works based on the biography that it says has had 30 million readers! It’s titled A MAN. Naturally, his “amazing” life has already been put on film: For Those I Loved (screenplay by Max Gallo), starring Michael York and Brigitte Fossey. It was also broadcast as a mini-series during the 1980’s in Europe. A second, shorter film was made by Frits Vrij : Seeking Martin Gray. 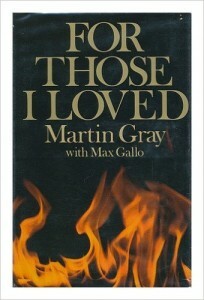 Max Gallo wrote the book that Gray says he never read! The original book cover, issued in 1971. Gallo was prominently given credit then, but in more recent times his name is no longer featured. But before I go any farther, you need to know that Grajewski didn’t even write his own fabulous story. The author is Max Gallo, a French politician/historian who was a Communist until 1956; later he switched to the Socialist party. It seems it was Gallo’s idea to write the book but he didn’t begin until after Grajewski had emigrated to the U.S , made a fortune in the 1950’s producing fake antiques in New York City, then moved to France with a wife and child in 1960. The great tragedy of Gray’s life is not found in the stories of his experience in the Warsaw ghetto and the Treblinka “death camp”, but in the death of his wife and four children in a 1970 house fire that took their lives but which he survived. That was harsh reality, while the Warsaw-Treblinka stories are fiction. It was after the loss of his family that he came out with the holocaust tales, very likely at the suggestion of his friend (or acquaintance? ), Max Gallo. This does more than suggest that Gray’s holocaust story came late, and was done with the same mentality that dreamed up the fake antiques business. It was Gallo, who was also the ghostwriter for Papillon, the “autobiography” of French convict Henri Charriere which was made into a blockbuster 1973 movie, who brought his exceptional writing skill to Gray’s story, and intended a similar success. Max Gallo, the ghostwriter of “For those I loved,” the story of Martin Gray. After Gray and his wife moved to the French Rivera with their one child in 1960, then had three more children — living an idyllic life in a large 300-year old farmhouse near the town of Tanneron — the tragic fire swept it all away in 1970. 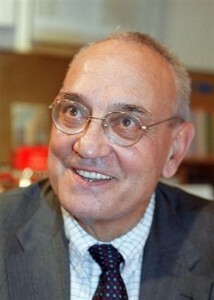 In the very next year, Gallo’s book was released, with the English translation coming out in 1972. Very fast work by M. Gallo … which is hard to fathom considering Gray’s intense personal pain at the time … but it was very possibly therapeutic. During [my] research for a Sunday Times inquiry into Gray’s work, M. Gallo informed me cooly that he ‘needed’ a long chapter on Treblinka because the book required something strong for pulling in readers. When I myself told Gray, the “author”, that he had manifestly never been to, nor escaped from Treblinka, he finally asked, despairingly: “But does it matter?” Wasn’t the only thing that Treblinka did happen, that it be written about, and that some Jews should be shown to have been heroic? At the end of the article, she declares, “One other thing assists the revisionists: many Jews, including survivors from the Warsaw Ghetto and Treblinka, are unwilling to bear witness and expose people like Gray for what they are.” What Sereny fails to say is that this is because liars don’t expose liars. Every surlievor account of Treblinka is false, as are most accounts of the Warsaw Ghetto. Sereny wants to believe it all happened as stated in the official narrative, but she is enough of a scholar to be embarrassed and angry by fakery that can be exploited by revisionists. So in 1979 she wrote the above-mentioned article in the very pro-Holocaust New Statesman. I want to mention that Dr. Robert Faurisson wrote a letter to the New Statesman commenting on this very article, which you can read here. Sereny, who is Jewish through her mother, has called “For those I loved” a fraudulent book. She is not the only Jew who has done so. However, as Eskin reports, before the book was published in English, the London Sunday Times ran an investigative report questioning its veracity. […] none of the survivors contacted by the London Sunday Times remembered Gray. The elaborate train station he described seeing on his reputed September 1942 arrival at Treblinka was actually constructed several months afterwards. […] “It was impossible to see the things Gray said he saw in Treblinka in the autumn of 1942,” one Treblinka survivor told The Times. Gray’s French publisher, Editions Robert Laffont, refused to research the allegations, and the U.S. and U.K. publishers also published their editions–and, later, in paperback, which was followed by a film. Only the German publisher halted the presses pending its own research results. Finally, to top it off — There is a Captain Waclaw Kopisto of the elite Polish Cichociemni unit, who took part in the raid on the German prison in Pinsk on 18 January 1943. In an interview with the Polish daily newspaper Nowiny Rzeszowskie (Rzeszów News) on 2 August 1990. he was shown the wartime photograph of Martin Gray (a.k.a. Mieczysław Grajewski) and said he had never seen Grajewski/Gray before in his life. Yet Gray/Gallo described his participation in this raid in his autobiographical book that we’re discussing. Steiner’s book on the surface even seems right: he is a man of talent and conviction, and it is hard to know how he could go so wrong. But what he finally produced was a hodgepodge of truth and falsehood, libelling both the dead and the living. The original French book had to be withdrawn and re-issued with all names changed. But it retained its format of imagined conversations and reactions – ie pure fiction – incredibly remaining, nonetheless, in serious bibliographies. Sereny, however, also looks past a lot of nonsense in order to hold to the official holocaust story line. For example, she herself changes the name of Aktion Reinhardt (which is the spelling the Germans always used) to Aktion Reinhard so she can claim it was named after Reinhard Heydrich — an absurd idea. But on some things she draws the line if she fears, as I’ve pointed out, that their lies are so obvious, and they are so popular, that they will help revisionists tear down the holocaust edifice. For her, Martin Gray is one of those, and I can only agree with her. *Note: Surlievor = survivor who lies about what he/she survived. Gray sounds like a Jewish US. Army Dept. of Psychological Warfare SHAEF (Syke War) asset. The 9,000 predominantly Jewish US Syke War soldiers trained at Camp Ritchie, Maryland and the Camp Sharpe Annex in Gettysburg were tasked, along with the Frankfurt Schoolers in R & A Dept. of the OSS, with the de-nazification of Germany. It was a social engineering exercise the successful techniques of which have been refined by advertising companies, think tanks and intelligence services and used on Americans ever since. I thought of that too, Charles, but he supposedly emigrated to the US in 1946 and stayed there until 1960. According to Wikipedia, he joined the Red Army as soon as the Soviets got close and became an officer in the NKVD secret police in Aug. 1944. Wonder where they got that information? His friends were all communists or very left. Picasso was a communist too. My father rescued Martin Gray and another boy during the war. My father was fighting with the russian partisans. Martin, George and my father went thru the war together as teenagers. The trio worked with the russians, as a result of that relationship, my father was able to rescue his aunt and uncle and cousin out of a camp in russia. I knew Martin and his family and was supposed to travel to france to spend the summer with his family the summer the fire occurred. We saw him again years later with his new wife who was a carbon copy of Dina. My parents saw them a lot when they were in NYC. Devorah Sklar wrote : “my father was able to rescue his aunt and uncle and cousin out of a camp in russia.” A camp run by Russians or by Germans ? Were there many such camps for Jews in Russia ? Why didn’t Martin Gray and Max Gallo speak of this story in the book ? How did Wiesel fool the OSE in France to take him from Buchenwald to France to recuperate? christine – if you do not have enough wits to post your comment under the article to which you are referring, then it is obvious to all that you don’t have the wits to engage intelligently about the issues at this web site. I cannot “repost” your comment to the article to which you intended it. You will have to do that.